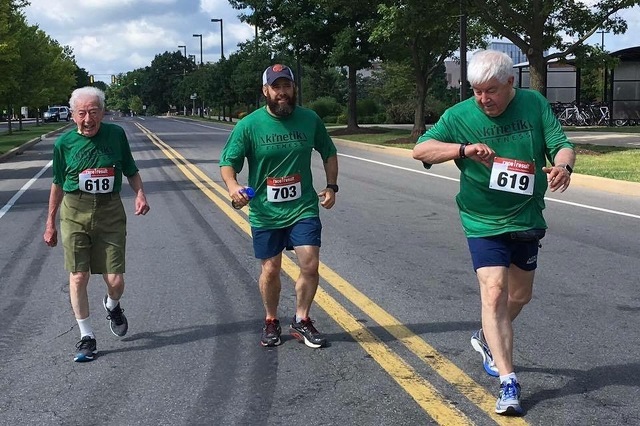 Three generations of Etzweilers finish the Sue Crowe Memorial Arts Festival Race last year in State College. STATE COLLEGE — Bob Etzweiler calls his grandfather his hero, and it is easy to see why. State College legend George Etzweiler will be running the 7.6-mile Mount Washington Road Race in New Hampshire on June 16, the day before Father’s Day. The race is a 4,650-foot climb up the highest peak in the Northeast. And, the most impressive thing is that George is 98 years old. He has completed the race 12 times, and this year he will again be besting his own record as the oldest runner to finish. Again this year, his grandson will be on his side the whole way up to the top. Bob is glad to have the opportunity to see the man he considers a father figure in action once again. A retired Penn State electrical engineering professor, the George started running in 1968 when he was 49. He said he was starting to feel out of shape and sluggish in the afternoon, and decided running might help him fell better. He started with runs around campus, suddenly losing 15 pounds and not feeling tired in the afternoon anymore. He hasn’t stopped since. When George started running, his son Larry was away at college. But, amazingly enough, Larry also had started running while he was away at school. “When I can home that winter for break, I told Dad that I have a new sport, running, and he said that is amazing I am doing the same thing,” said Larry Etzweiler. Larry said that since then, his dad, who is 27 years older, has been in just as good, or better, shape as him. The retired lawyer lives in New Jersey and the two once ran the New York City Marathon together. Larry said he was glad to have been able to share running with his father and he said he has been an inspiration to him for more than just his physical prowess. “He’s such a great father. He is so giving, so loving, so bright. We share a love of mathematics and it has brought us together,” said Larry. It was Larry who talked his father into running the Mount Washington race after he had run it himself with a group of friends. Larry ran it many times with his father, but health issues have kept him from doing it the past few years. He plans to be at the top when George finishes this year. George himself was inspired by his father, and said that he always looked up him. His father retired as a door-to-door salesman, but continued to work as a logger well into his later years. George trains often on the dirt roads that run up the ridges in Rothrock State Forest. He runs the Tussey Moutainback 50-mile Relay yearly in October on those same roads with his team, “Old Men of the Mountain.” The only prerequisite for the team is that you must be over 65 to be a part of it. Last week, as he was finishing his training, a crew from Runner’s World magazine was on hand to watch George's workouts, and they plan to chronicle his race up Mount Washington. George said everybody asks how he runs up those mountain roads. Bob remembers running with 72 miles with George during the week his grandfather turned 72, and he often thinks about something that George said about what he does when he feels like quitting. “He said, ‘If you say you can’t do something, you start putting the nails in your coffin real quick,’ and that has stuck with me through all these years. And, it is good advice for anybody, I think. And, it perfectly sums up my grandfather,” said Bob. George said he was blessed to have a great family supporting him through the years. He and his wife, Mary, had three children, Larry, Shirley Fye and Charles Etzweiler, four grandchildren and five great-grandchildren. Mary passed away in 2010 and George said he thinks about her every day. He said she was supportive of his running, and when times get hard he calls on memories of her to help him stay strong. He particularly remembers a time when she was sick. George was running a leg of the Tussey Mountainback with his team, but he didn’t want to be away from her for too long. He went to run his leg of the relay and was planning to rush back afterward to be home with his wife, but Mary surprised him and was in the car to pick him up where he finished, with her oxygen tank in tow. For a long time, George had joked that he would run the Mount Washington Race until he was 100 years old, and then "drop dead" at the finish line, but he has new plan now. Last year was a tough run up Mount Washington for George, as the hot weather really slowed him down, said Bob. His grandson said he gets a little worried for his grandfather’s health as they run the race, but then he remembers that George is out there doing what he wants to do and it makes him smile.